Natural fibers are porous in nature which is useful feature for sound absorption. Natural materials are ecofriendly and less harmful. Natural fibers have potential to play important role in acoustic treatments at various sensitive areas like hospitals, classroom, research laboratories, libraries, residential areas and offices. Experiments were conducted on natural fibers to understand its sound loss potential. The present paper also discusses method of sample preparation for the different compositions. Bagasse, Rice husk, Rice straw, Wood dust were tested to measure their sound loss potential. The test setup used for estimating the sound loss potential consisted of an emitter and receiver. Tests were conducted by measuring the sound level at receiver without any obstruction and readings were repeated by placing the sample in between. The difference of the two reading estimated the sound loss for that sample. The sound absorption coefficient for each case was estimated and compared with other similar materials reported in the literature. 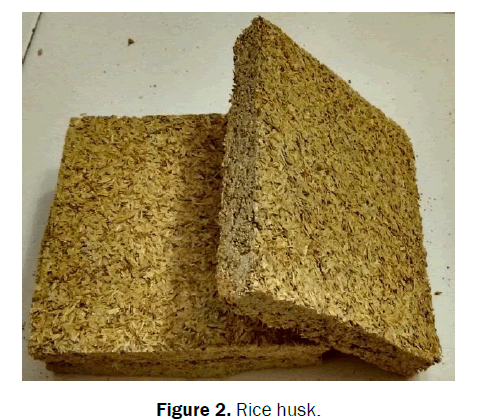 It was observed that sample made by combinations of rice husk, rice straw and wood dust gave considerable improvement in the performance. The present article discusses the sample preparation method, test setup used and results observed for different natural fibers. The present paper also gives results of compositions of different natural materials under investigation. Maximum sound absorption coefficient of the order of 0.29 was observed for Rice straw and Composition of Rice Straw and Wood dust sample. Noise is one of the important sources of environmental pollution. The increase in noise pollution is result of rapid industrialization, vehicular traffic, trains, airplanes etc. which has adverse effect on human health. The technological development across the globe has many advantages for improving quality of life but it has certain side effects on human health, according to the recently estimated statistical data revealed that percentage of population was suffering from (53%) headaches, (36%) high blood pressure, (40%) anxiety, (36%) hearing disabilities, (15%) cardiovascular diseases, (67%) irritability and (61%) insomnia . In order to overcome the problem of noise specially at sensitive areas such as hospitals, scientific laboratories, classrooms, residential areas and offices etc. acoustic treatment is essential so that the people occupying sensitive areas are not prone to pollution resulting due to sound emitted from various sources. Porous materials are widely used for noise control, which have high potential of sound absorption. These materials are categorized as porous foam or fibrous medium. Fibrous medium used for preparing sound absorbers are glass or rock wool which has high acoustic absorption properties. Foam is made from polyurethane. Foam has internal voids which traps the sound energy thus acts as good acoustic absorbing mediums . This technique used for noise control is known as passive noise control method which uses materials like glass wool, polyurethane foam, asbestos etc . These materials are expensive, flammable, non-biodegradable and harmful to society . Hence it is important to investigate natural fibers to replace synthetic materials for sound absorption which have benefit of being easily available, low cost, recyclable, ecofriendly. Natural fibers have been receiving increased attention for applications in the field of acoustics. A variety of natural fibers are already being considered for commercial utilization in building and construction applications. Natural fibers are generally categorized as vegetable fibers, stalk or wood fibers, bast or skin fibers, leaf fibers, seed fibers and fruit fibers . Some of naturals fibers which has scope for applications are reeds, bagasse, cattail, corncob, cotton, date palm, durian, oil palm fiber, pineapple leaves, rice, sansevieria fiber, sunflower, straw bale etc. . The theoretical methods are based on physical considerations of sound propagation in materials, more complex independent variables such as tortuosity and porosity limits their use in practical applications . There are several methods for measuring acoustic absorption that are normally carried out in impedance tubes with a loudspeaker and several microphones at low frequencies . Some of the textile based sound absorbing materials have good acoustical absorbing properties and flexibility of applications. Several authors have successfully predicted absorption coefficients for the textile sound absorbing materials based on geometrical parameters . Coconut coir fiber is widely used natural fiber for insulation and acoustic applications. Coconut coir fiber is prepared using combinations of latex and other additives with the coir fiber. Coir fiber with perforated plates on outer surface was utilized for enhancing sound absorption . Use of Vegetable fiber like hemp has been reported for green building materials. Hemp concrete was made using different binders for utilizing the porosity which significantly enhanced the sound absorption capacity . Sound absorption of tea-leaf-fiber was studied with sample thickness of 20 and 30 mm for frequency ranges of 500-3200 and 500-2400 hz respectively. Tea-leaf-fiber is good alternative for conventional materials due to its remarkable sound attenuation . Coconut coir fiber has been used for construction of acoustic absorbing panel with help of perforated plates. These acoustic panels were tested for estimating acoustic absorption coefficient . Acoustic absorbers were prepared utilizing sugarcane fibers as sustainable alternative over synthetic materials and the results shown were considerable . There are certain natural fibers which have scarcely been tested or reported. The present paper presents tests results such natural material. Sound absorption potentials are decided on the basis of noise reduction levels obtained using samples made by natural fibers and combinations of materials. A sound loss measurement test setup was used for measuring the sound loss potential of prepared samples. Raw micro porous materials from natural fiber were cut using chopping machine to prepare small uniform pieces of fiber filaments. The chopped materials were refined by separating the impurities present in it so that only natural raw material goes into sample preparation. A mould of desired sample size (110 mm × 120 mm × 20 mm) was used for sample preparation to have constant sample thickness. Fiber filaments were blended with binder uniformly in the mould. Rubber synthetic R505 was used as adhesive. Prepared sample were kept under 90 kg weight for 48 hours and then solar dried for moisture removal for 72 hours. Figures 1-4 gives the samples prepared from Wood Dust, Rice husk, Rice straw and Bagasse respectively. Compositions of different materials were prepared by using adhesive to glue two individual samples. Compositions of natural fibers were also tested and results of the same are presented. Attention was paid during sample preparation to ensure samples of exactly same geometry, with same pressure applied and constant solar drying period. The constant pressure applied during the sample preparation ensured uniform internal structure in each case. Test setup (Box size 800 mm × 150 mm × 140 mm and Internal cross section dimensions to accommodate sample 110 mm × 120 mm) used for experimentation was standard sound loss test setup as shown in Figure 5 used for study of sound loss by different materials specimens prepared. Setup consists of sound source, sound receiver, closed wooden box and dB meter for measurement of sound at receiver end. The source and the receiver were placed 600 mm apart equally spaced from the center of the box and at an height of 70 mm. Source spectrum was varied in the frequency range of 125 Hz to 1500 Hz. Samples were tested with two different sound levels emitted from source (70 and 74 dB). Tests were conducted for 30 minutes for each sample at each sound level. Total testing time for each sample at two different sound levels was 1 hour. Three readings at a time interval of 10 minutes were recorded. Average reading for each source sound level has been reported to minimize error in measurement. To avoid flanking noise from surrounding interference in the measurement, the box was insulated using foam on inner walls and all the tests were conducted in the laboratory past midnight when all the other interfering noise are absent. 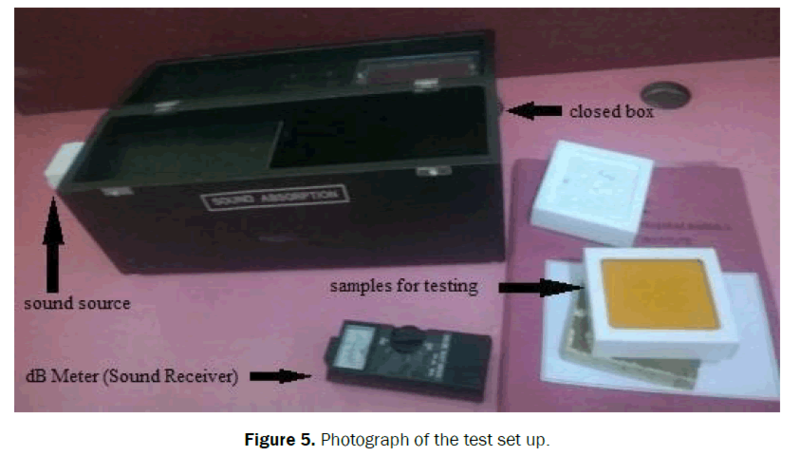 Figure 5: Photograph of the test set up. Figure 6: Method employed for measuring the sound loss with samples placed in between source and emitter. • Switch ON the dB meter and Sound Source to first sound level (70 dB). • Closing the door of the wooden box and recording the direct reading on dB meter without using any sound absorbing material specimen in between the source and receiver. • Opening the box door and keeping the specimen as barrier between the source and receiver and closing the box. • Recording the indirect reading while using specimen as barrier in between the source and receiver. • Repeating the procedure for different sample specimens. The tests were conducted with two different sound levels viz. 70 and 74 dB. Tests were also conducted on composites by joining samples of two different materials but thickness in each case (single base material as well as composites of different materials) kept 40 mm constant for original sample as well as compositions to understand effect of pure natural fiber vis-à-vis its composites. Following tables and graphs give the results obtained from various tests carried out based on the procedure described above. Initial Sound Level (dB)*-Readings obtained without any sound barrier in between sound source and receiver. Final Sound Level (dB)**- Reading obtained by using sound barrier in between the sound source and receiver. Table 1 indicates maximum Sound loss of 20 dB and 18 dB for the two levels respectively during the tests conducted in case of test samples prepared from of composite of Rice Husk and Rice Straw. Table 1. Sound loss results from tests conducted on rice husk based compositions. Table 2 indicates maximum sound loss of 20 dB and 18 dB for the two sound levels respectively during the tests conducted in case of test samples prepared from composite of bagasse and rice straw. Table 3 indicates maximum sound loss of 22 dB and 20 dB for the two sound intensities respectively in case of test conducted on sample prepared from pure rice straw. Table 3. Sound loss results from tests conducted on rice straw based compositions. Table 4 indicates maximum sound loss of 22 dB and 20 dB for the two sound levels respectively during the tests conducted in case of test conducted on samples prepared from composite of wood dust and rice straw. Table 4. Sound loss results from tests conducted on wood dust based compositions. Graphs of investigation on different combinations of materials and their Sound loss levels at two distinct sound levels emitted (70 and 74 dB) are plotted below for the sound level measure at the receiver with various tests samples and there composites prepared and placed as barrier between the sound source and emitter. 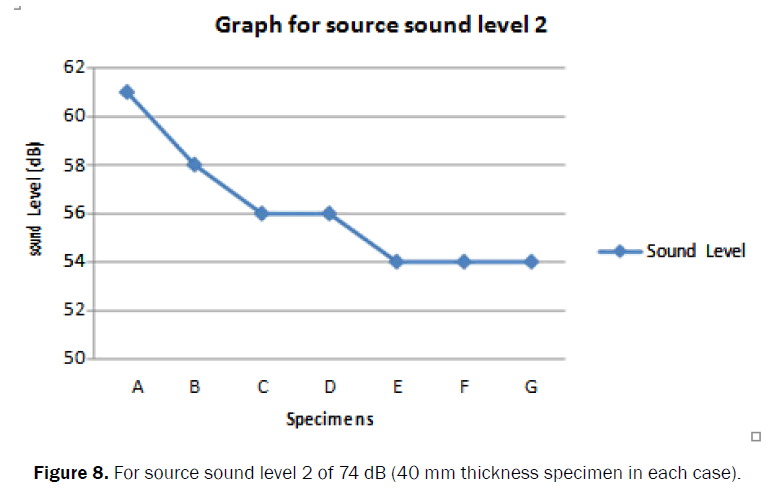 Figure 7: For source sound level 1 of 70 dB (40 mm thickness specimen in each case). B- Bagasse with 40 mm thickness by combinations of two samples of 20 mm thickness. D- Wood dust with 40 mm thickness by combinations of two samples of 20 mm thickness. 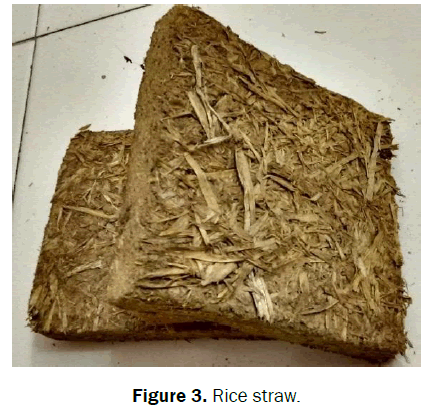 F- Rice Straw with 40 mm thickness by combinations of two samples of 20 mm thickness. G- Combination of wood dust and Rice Straw samples of 20 mm thickness each (total 40 mm). Figure 8: For source sound level 2 of 74 dB (40 mm thickness specimen in each case). C- Wood dust with 40 mm thickness by combinations of two samples of 20 mm thickness. Figure 7 shows the sound level decrements for different combinations form 55 dB to 48 dB with reference to direct reading without barrier for sound level of 70 dB. Similarly Figure 8 shows decrement from 61dB to 54dB with reference to direct sound level of 74 dB. Tables 5 and 6 give the sound absorption coefficient from literature and from the current tests conducted respectively. Table 5. Acoustic absorption coefficient from literature for natural and synthetic materials. Note- Sound absorption coefficients mentioned in the table above are average values for the low frequency range of the source i.e., 125 Hz to 1500 Hz. Note- Sound absorption coefficients mentioned in the table above are average values for the low frequency range of the source i.e., 125 Hz to 1500 Hz by taking average of the two sound levels. The sound absorption coefficients for materials tested in the present work can be compared with natural fibers reported in literature for frequency range between 125 Hz to 1500 Hz. Above results are in the range of 2 to 15% as compared to the reference values in literature. Figure 9 shows sound absorption coefficient for rice straw and composition of rice straw and wood dust were maximum and around 0.29. Figure 9: Sound absorption coefficient for rice straw and composition of rice straw and wood dust were maximum and around 0.29. Sound absorption coefficients obtained for different materials and material compositions in this work are comparable with the values referred for different materials from literature. Specimens used in present work give remarkable sound absorption coefficients especially rice straw samples and sample made from combinations of wood dust and rice straw for the frequency range of 125 Hz to 1500 Hz. Maximum coefficient of sound absorption was for Rice straw and Composition of Rice straw and Wood dust which was estimated to be 0.29. Rahman LAA, et al. Experimental Study on Natural Fibers for Green Acoustic Absorption Materials. American J of ApldSci.2013;10:1307-1314. Chao-Nan W and Jiunn-Hwan T. Experimental study of the Absorption Characteristics of Some Porous Fibrous Materials. Applied Acoustics.2011;62:447-459. Elwaleed AK, et al. Experimental Study in the Effect of Compression on the Sound Absorption of Date Palm Fibers. World AppldSci J.2014;40-44. Fatima S and Mohanty AR. Acoustical and Fire Retardant Properties of Jute Composite Materials. Applied Acoustics.2011;72:108-114. Berardi U and Iannce G. Acoustical Characterization of Natural Fibers for Sound Absorption Applications. Buildgand Environ. 2015;1-13. Asdrubali F, et al. 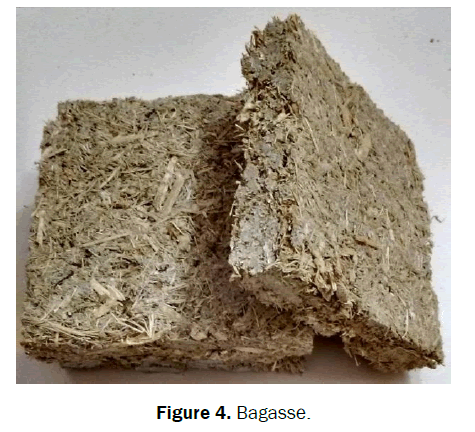 A Review of Conventional Sustainable Building Insulation Materials. Sustainable Materls and Tech.2015;4:1-17. Oliva D andHongiston V. Sound Absorption of Porous Materials – Accuracy of Prediction Methods. Applied Acoustics.2013;74:1473-1479. Jiancheng T, et al. Static Flow Resistivity Measurements Based on the ISO 10534.2 Standard Impedance Tube. Buildg and Environ.2015;1-6. Pieren R and Kurt Heutschi K. Predicting Sound Absorption Coefficient of Light Weight Multilayer Curtains Using the Equivalent Circuit Method. Applied Acoustics.2015;92:27-41. Fouladi MH, et al. Utilization of Coir Fiber in Multilayer Acoustic Absorption Panel. Applied Acoustics.2010;71:241-249. Gle P, et al. Acoustical Properties of Materials made of Vegetable Particles with Several Scales of Porosity. Applied Acoustics.2011;72:249-259. Ersoy S and Haluk K. Investigation of Industrial Tea-Leaf-Fiber Waste Material for its Sound Absorption Properties. Applied Acoustics.2009;70:215-220. Zulkifli R, et al. Noise Control using Coconut Coir fiber Sound Absorber with Porous Layer backing and Perforated Panel. AmeriJ Applid Sci.2010;7:260-264. Putra A, et al. Utilizing Sugarcane Wasted Fibers as A Sustainable Acoustics Absorber. Procedia Eng. 2013;53:632-638.